This past weekend was the Great Ohio River Odyssey, our eighth Kentucky Waterman Series event of year, which marked my third year of being involved organizing paddlesports races on the Ohio River in Louisville in various capacities. I just want to give thanks to all of our racers, EKI intern Reed Mattison for his visual coverage, our volunteers (Allison Drewery, Matt Walker & Melinda Gregory Walker of BeintheWater, Maggie L. Burton, Kelly Little, Austin Yates, Bill and Sandy Harold, Casey Steele Heeter), Josh Patton for bringing our branding design concept to life, Margaret Conrad for helping me sew our racer's finisher medal ribbons, and Jenny & Aaron Denney of Vindura for their awesome timing job. We are eternally grateful to our sponsors for helping support the race & giving our racers a chance to will several cool prizes; Series sponsor: Southern Paddlesports, HITCASE, Water + Oak Outdoor Company, Blue Moon Canoe & Kayak, Oldham County Parks and Recreation, Tour Oldham County KY, Kingfish Louisville, Captain's Quarters Riverside Grille, & Heine Brothers' Coffee. Elaine Harold & Rafael Reyes battle it out as they near the finish line at the Community Boathouse in downtown Louisville. Another big round of gratitude goes to the Louisville Metro Police Department River Patrol, Clark County Indiana Sheriff's Office United States Coast Guard Auxiliary, Harrods Creek Fire Protection District, & Kentucky Department of Fish and Wildlife Resources for providing patrol craft that insured we had zero incidents throughout the day. All in all everyone involved made the Odyssey a smashing success, coupled with Mother Nature blessing us with blue skies, flat water, and relatively no wind! 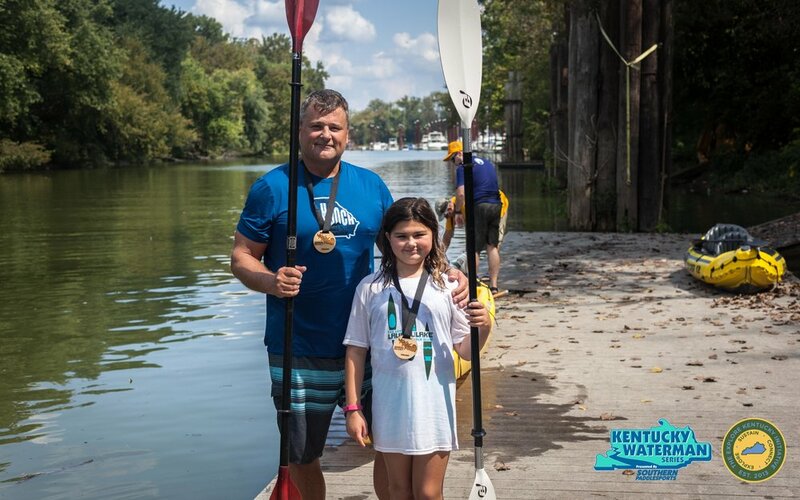 As an organization, we're excited to be at the forefront of contemporary paddlesports racing in Kentucky and grateful for the media coverage we have received in the inaugural year of the series. The Courier Journal, home to some of the hardest working/talented fellow journalists I know; (Kirby Adams, Marty Pearl and Dustin Alton Strupp), provided excellent pre & post race coverage of the Odyssey . This is important as it allows paddlesports racing to reach the general public outside of our small niche community, hopefully inspiring more people to pick up racing/fitness paddling as a way to be active and healthy. Lastly I want to give props to some of the brilliant performances I witnessed in person on the course as a race director; Elaine Harold in the female high performance kayak class (a kayak longer than 17' built for speed) with the 1st overall finishing time of 1 hr and 4 minutes for our 7 mile course , my friend Scott Cummins coming out on top after a 22 mile shoot-out between him and Terry Smith with a finish in 3 hours, SUPers Adrian Angell & Todd Suter taking on the 22 mile course, which helps further to dispel the myth in our region that stand up paddleboards are only for short distances races, Mimi Hahn of Louisville's Endless Summer Paddle Company (who we partnered with this year for a yoga retreat), earning 1st place in the 7 mile with a time of 1 hour & 34 minutes. This race really shook up our series standings with many people going up/down with their ranking. Also I was stoked about all of the folks who took part in the inaugural 2.5 Harrods Creek Race as short distances are a perfect way to break into the racing scene. One of the most exciting aspects all year of the series is the number of people who are following the series, coming to pretty much every race, and leaving it all on the water. Paddlers like Randy Ray, Tim Schramm, Mark & Erik Snider, George Hall, Andrew Gooding, Cheryl Gault, Leslie Maclin, Lee Droppelman, Laura Mirabile, Brian Kopke, Aaron Denney & Joe Stibler; just to name a few. To see more awesome results and visual coverage of the Odyssey captured by myself and our intern Reed Mattison click the image below. P.S We were stoked to support Wilderness Louisville continue to provide equitable access to the outdoors for families and youth in the Greater Louisville area, as a portion of our race proceeds are going to support their organization!